We had a late day today and I wanted to get dinner together quickly. I recently purchased a good looking bottle of Lucini brand Umbrian Lentil Soup. I've seen this company's olive oils, and in the last year or so have noticed their soups. We loved visiting Umbria, just east of Tuscany, a few years ago! 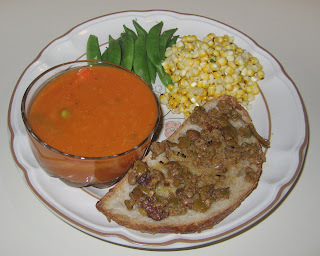 I decided to make a simple dinner, taking advantage of this soup. I simply heated the soup slowly and, taking their suggestion, added a little bit of extra virgin olive oil. I also served some rosemary crostini, which proved particularly good cut into thirds and dunked in the soup. I made two ears of corn-off-the-cob with Earth Balance margarine, Greek oregano, salt, and lime. A nice salad rounded out the meal, with lemon tahini dressing mixed in, as well as greens, olives, avocado, and tomato. As I was working out today, I was a little preoccupied with what I would prepare for dinner. We haven't done a proper grocery shopping since returning from the long weekend, and I knew I was low on produce. As I was discussing in Tuesday's blog entry, I loved the Caribbean-inspired pasta that we had at Nine Mile in Asheville, and was also thinking about that so-tasty pasta as I was exercising. I want to try to make something like we had at that restaurant and use perhaps a thin angel hair pasta. But for tonight, I was inspired by that meal but in the direction of cooking down a sauce primarily of coconut milk and cooking Thai rice noodles in the sauce. I poured a can (13.5 ounces) of fat-reduced organic coconut milk into a large sauce pan and mixed in the third of a bottle (about 5 ounces out of around 15 ounces) that I had left of Rao's marinara sauce, as well as two finely chopped cloves (not full bulbs!) of garlic. I brought the mixture to a near boil over medium-high heat, stirring frequently. About ten minutes later, I added half a package of tempeh, cut into small cubes (the exact size isn't important; with frequent stirring and heat, the tempeh broke down into a crumble); about a half dozen basil leaves (I kept small leaves intact and roughly hand-cut large ones in half), and half a teaspoonful or so of tiny Greek oregano leaves (I still don't know if this plant a restaurant-owner gave me is Greek oregano, as he claims, or lemon sage, as it tastes like). After a total of about thirty minutes, the sauce was reduced a bit and somewhat thickened. I mixed in a little crushed red pepper (for heat; were it not for my wife's nursing, I would have cooked a Thai chili pepper into the sauce - provided that I had such a pepper in house!) and salt, then added enough fettucine style flattened rice noodles to serve the two of us. The sauce quickly thickened around the noodles; in fact, perhaps too quickly. I simmered for about five minutes then turned the heat off and left the contents in the pan for another five minutes or so, stirring a few times. The noodles were just barely al dente and were good, but next time I think I would start by soaking the noodles in hot tap water for 5-10 minutes before adding to the sauce. I mixed in a half dozen drops of lime juice and served. I think the meal was good and was a bit reminiscent of the restaurant dish. It could have used a little more pop (hot pepper, perhaps some lemongrass and/or onion), but was interesting and tasty. I finished off the meal with a tablespoonful of so-tasty vegan (of course!) coconut milk-based custard that we brought home from Rosetta's Kitchen. Like I did when I made my "Taxday Green Chard", I cut a bunch of green chard into quarter inch strips, working from the stems up to the leaves. As I got higher, I let the width this time get a little greater, to perhaps a bit more than 1/2". I sauteed about a third of a yellow onion, cut into thin strips maybe 1/4" x 3/4". 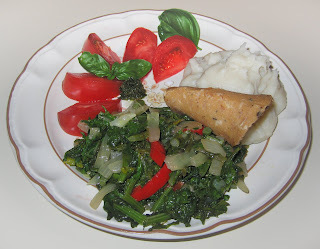 When the onion started to clear, I added the chopped chard and strips of red bell pepper. I cooked for about five more minutes till the chard was cooked through, and added a little salt before serving. I also served some tomatoes with fresh basil from my garden and mashed potatoes. This past weekend while in Asheville, I picked up a product we don't get locally, Field Roast deli slices. I served a rolled up lentil sage deli slice. It was a good and filling meal! We had a very nice long weekend Saturday through last night in Asheville, North Carolina, a lovely small city in the Blue Ridge Mountains about 3 1/2 hours from home. It is very vegan friendly, and we love eating and shopping in this progressive town. We ate at our favorite restaurant the first night, Laughing Seed, where we shared a great salad that included purple potatoes and sauteed beet chips, and I had a very good, chewy, breaded seitan dish. I briefly visited for a cookie, but we returned on Monday night for dinner, the almost-1-year-old Firestorm Cafe and Books, "a worker-owned community event space". It's a vegan business "established as a worker-owned and self-managed business, we aim to provide community space, critical literature and an alternative economic model based on cooperative, libertarian principles. ... wide range of events, workshops, film screenings, fund raisers and presentations. Additionally, we serve food and beverages all day long. ... run without bosses or supervisors, relying instead on a horizontal workplace. ... we are committed to a not-for-profit model and we will reinvest 100% of our earnings in the community once we are able to pay a living wage." Wow! We had good, hearty sandwiches there Monday before heading home. We went to another, for us, new and interesting restaurant on Sunday night, Nine Mile, in the historic Montford section of town. 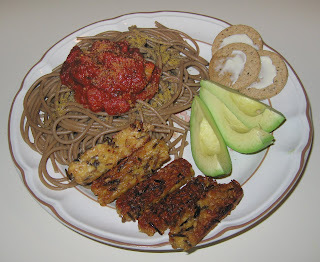 It features "Caribbean inspired pasta dishes"; what a nice idea and flavor combination! They list many items as explicitly vegan and can substitute tofu or tempeh for meat or fish. 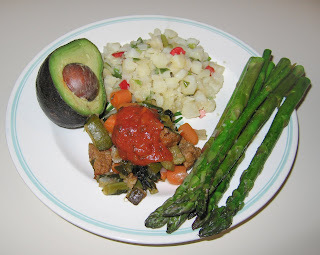 I had, with tempeh, a dish called Negril Nights ("reminiscent of a night on the beach in Negril. Grilled salt and peppered ... with garden fresh vegetables, and fire roasted tomatoes, sauteed in jerk coconut milk. Served spinach fettucine & topped with spring onions." They are careful and told me that the fettucine wasn't vegan, but gave me several pasta choices that were. It was delicious - I want to try to make something like this! For brunch on Monday, we went to another restaurant, along with Laughing Seed, that we always try to visit, all-vegetarian and mostly vegan Rosetta's Kitchen. I enjoyed cornbread, tempeh, and a strawberry tart. We brought home (and I look forward tomorrow to trying!) coconut milk-based custard. Sami's Bakery millet and flax pizza crust, which I used with dinner tonight. Chicago Soydairy, a company whose products we don't get but whose owners Ryan and Daniel I have met, have a new highly recommended vegan cheese called Teese. As their website says, "Teese Vegan Cheese is a melting dairy-free soy cheese made by the Chicago Soydairy. Teese has a taste and texture that is miles ahead of the other vegan soy cheese brands on the market. Our vegan cheese is made in a 100% dairy-free, peanut and tree-nut free facility and is trans fat and gluten free. 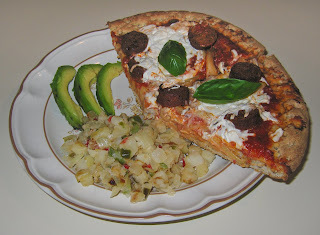 Teese Vegan Cheese is a tasty and healthy alternative to dairy cheese. It has exceptional melting qualities and can be applied to any application you would use traditional dairy cheese." We brought back several other tasty treats, including baked goods from Firestorm. 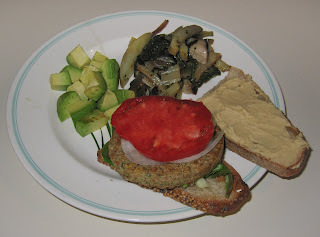 From the coop, we got Field Roast deli slices, something we don't get locally; I picked up the lentil sage. We love Turtle Mountain Purely Decadent coconut milk-based ice creams and often keep them in stock at home. But my first taste of a coconut-milk ice cream was Coconut Bliss. As I wrote in this blog last September, "I have been predicting for some time that coconut milk will more commonly be available as a base for 'ice cream' (I also predict that we will be seeing more hemp-based products - I can't wait to find a hemp cheese!). When my wife and I were in California back in May, we found in Bolinas' People's Store coop a fabulous coconut milk-based ice cream, Coconut Bliss. I sure wish we could get it here, as well." Well, the French Broad Coop had Coconut Bliss in three flavors, Cherry Amaretto (which I bought - the same flavor we loved in California) and I think Cappuccino and maybe Chocolate Hazelut Fudge. I will soon sit down with a small scoop each of Purely Decadent and Coconut Bliss brands ice cream and compare! We were hanging out at Weaver Street Market, enjoying the Friday early evening, and thinking we'd eat at Panzanella's just behind the store, but baby was being distracted so we went home. I picked a few things up that I could easily prepare, including a wonderful pretzel-shaped bread (similar in taste to their seeded ciabatta) that Weaver Street sometimes makes. There is a line of convenient Indian (and Thai, I believe) foods by a company called Tasty Byte; the ingredients are good and don't include all sorts of strange sounding chemicals, and they just require boiling for a few minutes within the foil bag the food comes in. I bought their Punjab Eggplant - it turned out to be very tasty (and a bit spicy hot) -- I really liked it! I also made a big salad including baby herb salad greens, tomato, red bell pepper, walnuts, and big pieces of olives, all mixed together with lemon tahini dressing (I actually rarely use dressing, but rather lemon or lime juice along with a little salt and freshly ground black pepper). It was a good meal! 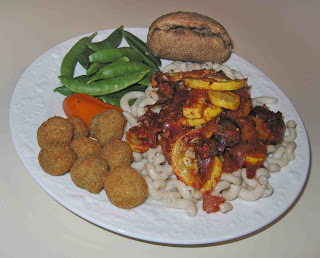 Tonight for dinner, I prepared a simple marinara sauce with sauteed summer squash and served it over organic brown rice fusilli pasta by Tinkyada (ricepasta.com) . A friend recently pointed out that Alexia brand frozen mushroom bites are vegan! I've seen but not tried this product. I included it with dinner and really liked it! We're lucky to have soups to purchase from a local soup maker. This week the soups are a Summer Squash in Broth with Cornmeal Dumplings and Cilantro Salsa using locally ground cornmeal - but we took the option to omit the dumplings, which contain eggs; and Escarole and Basil Soup with Navy Beans. For late May, we had surprisingly cool weather, so the Escarole soup was very welcome! I also made some corn-off-the-cob, roasted over an open flame, stripped from the cobs, then mixed with Earth Balance non-hydrogenated margarine, Volcano Lime Burst (water, organic lime juice, lemon oil), and some alder smoked salt that I brought back from California about a year ago. Finally, in addition to a salad topped with lemon hummus, I served delicious roasted onion crackers that I recently picked up. The crackers were so good that I snacked on a few right after opening the package while preparing dinner, and even had one or two as I was cleaning up. It was a simple but good dinner! I had five round Thai eggplants that I had to use before they spoiled. I had never purchased a Thai eggplant, and thought I'd make something like the classic Pud Makua Yow (see, for example, the recipe at thaitable.com), eggplant cooked with garlic and, just before serving, fresh Thai basil. I didn't have hot chili pepper on hand (and my nursing wife has had a preference for milder foods, anyway), but just this weekend had planted some Italian basil (no Thai basil), so I gave it a whirl. I prepared the five eggplants by cutting into thick 1/4+ " slices and then halving. I took four garlic cloves and sliced them thinly. In lieu of hot pepper, I took about a quarter sweet yellow bell pepper and cut it into 1/2" squares. Customizing the dish to my vegan sensibility, I took a tub of seitan and cut it into matchsticks, perhaps 1" long by less than 1/4" thick and wide. I brought a little lemon sage (which was given to me as Greek oregano, but I think it's lemon sage) and about 8-10 large leaves of basil in from my garden and just, for now, washed them clean. I heated the garlic and seitan in a saucepan with a little garlic grapeseed oil over medium heat, nearly constantly stirring in this non-nonstick (!) pan. As the garlic and seitan started showing a little bit of brown color in about 3 or 4 minutes, I added the eggplant and 2/3 cup of water, then reduced the heat to low and cooked, covered, for about 7-10 minutes till the eggplant became a bit clear and soft. I then mixed in the lemon sage and, coarsely hand cut into maybe 1" pieces, the basil, as well as some crushed red pepper and a bit of soy sauce. I stirred briefly then served. 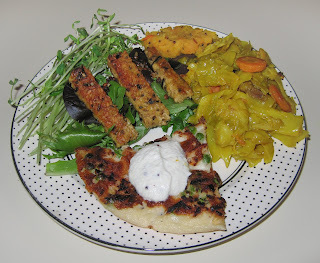 I would have served with rice, but my wife had picked up some interesting looking vegan foccacia at the Carrboro Farmer's Market this past Saturday, and I wanted to use it up. So I heated the bread and served it to the side. Last week we started feeding my almost six-month-old baby solid foods! We started with avocado, which went well for three days. We introduced lentils (the water that the lentils were cooked in), which she didn't seem to like, on Saturday, and today tried sweet potato mixed with breast milk, which she also didn't take to - at least on first try. So we had some avocado cut and ready to be finished, and most of a sweet potato that was baked this morning, and included them in tonight's dinner as a gentle reminder of her. It was a good dinner! 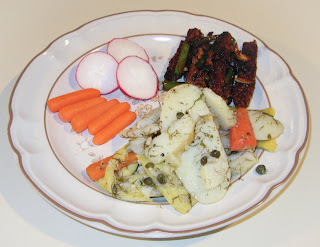 I had some leftover Ethiopian curried vegetables from a few days ago, and finished them up with tonight's dinner. 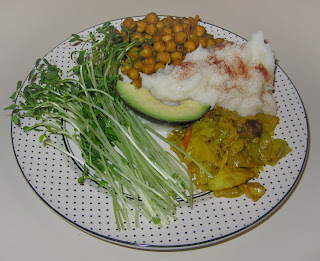 It was an easy dinner to prepare, because I heated some curried chickpeas with coconut milk that I found at Weaver Street Market (good but the turmeric was both too much in quantity and not really cooked but seemingly added in at the end) and really only made mashed potatoes (which I'm always a big fan of as long as they're vegan!). I also served some avocado and sweet pea greens. 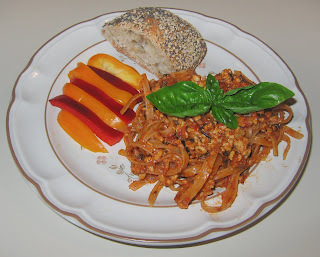 I wanted to use up the maybe 4-5 ounces of the Fra Diavolo pasta sauce I opened last Wednesday, and wanted to try organic brown rice fusilli pasta by Tinkyada (ricepasta.com) . I've had other pastas by this company and they all have been good. Into a medium saucepan with a little bit of olive oil, I started sauteeing 1/4 large yellow onion, diced into small-medium 1/4"+ cubes. A minute or so later, I added 4 ounces of sliced mixed mushrooms (baby bella, shiitake, and oyster), and cooked till the mushroom was reduced a bit and fully cooked, though not shrunken and brown. 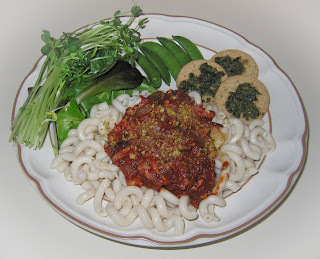 I then added the pasta sauce as well as a small can of tomato paste. To make it less thick, I added a significant amount of red wine, perhaps a bit more than a half cup, as well as a teaspoonful or so of fresh Greek oregano. The owner-chef of Cafe Trilussa in Chapel Hill, Giovanni, gave me this pot of "Greek oregano" to plant in my garden, telling me it will grow fast and, unlike the oregano I have in my herb bed, will not go dormant in the winter. However, I am pretty sure it is lemon sage that he gave me, which isn't bad as I was thinking a few weeks back of acquiring lemon sage for my garden! The leaves of what Giovanni gave me are small and it has a pronounced lemon taste. Regardless of oregano or sage, I also added some salt and crushed red pepper, as well as chunks of tempeh, and simmered on low heat for 15 minutes or so. I then added about two tablespoonfuls of finely chopped onion to get both cooked and fresh onion flavors. I let it simmer another minute or two, then served over the pasta. It was very good! I also served some delicious English walnut oat crackers, topped with pesto. They were great! Sunshine Burger has a new falafel burger (and, according to their website, also a new breakfast burger)! We like their products; not only are they vegan, but there are organic choices and the products are non-soy. I was happy to find this a day or two ago and served it today, topped with lemon hummus. It was good! My only complaint was that the burger was crumbly, but it was mainly my fault, serving it on a small piece of bread. This burger calls for a proper vegan bun! Today was a big day; for a week or so, my almost 6-month-old daughter has been showing signs of being ready for solid food. On our doctor's recommendation, as well as what we subsequently found in our own research, avocado is an ideal first food after breast milk. So this afternoon we sat our lovely daughter down, expecting her to reject the avocado that we offered her, but she accepted and seemed to like it! She only took maybe a quarter teaspoonful, but it was a big first step! So I guess we'll have avocado around for her till we try another food. 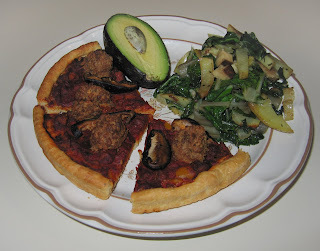 I served some pieces of avocado with dinner, as well as some leftover kale from day before yesterday. We had a pediatrician's appointment and are excited that we can start our almost-six-month-old baby on some solid food! We stopped to pick up some organic avocados, an ideal first food because of its richness. We plan to start tomorrow - the first small step to a lifetime of eating! We were thus a bit delayed in getting home. I picked up at Whole Foods a tasty looking Ethiopian curried vegetable dish (I also got some curried chickpeas from Weaver Street Market, and may use them tomorrow). I simply heated the uttapam ("Indian pancake" made with fermented rice and lentils) that was leftover from our Mother's Day dinner, dolloped on top the coconut chutney we had left, served the curried vegetables, and sauteed some tempeh, which I served with salad that included sweet pea greens. I found unusually large shiitake mushrooms at Whole Foods that reminded me of large ones I harvest at home whenever my log is ready to generate another crop. 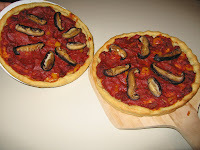 I came up with the idea of making a nice shiitake mushroom pizza. I crumbled a spicy vegan Mexican Chipotle sausage by the Field Roast Grain Meat Company and sauteed it with some yellow bell pepper chunks and thick slices of shiitake. 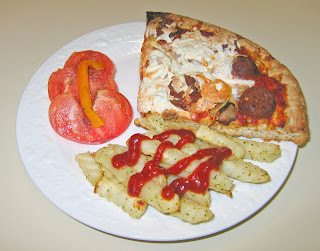 I mixed the pepper and sausage into about a third of the approximately 23-ounce can of Fra Diavolo pasta sauce and a small can of tomato paste, then spread it onto two delicious frozen Vicolo Pizza organic cornmeal crust pizza shells. I spread the mushrooms evenly on top then baked for about 15 minutes on my pizza stone that had been heated in a 425°F oven. I also heated in the oven some onion rings and potato "tater tots". 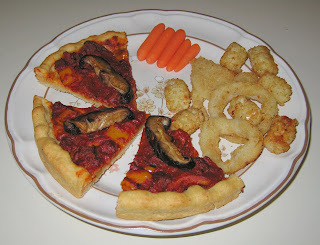 It was a very nice dinner - the pizza was great! 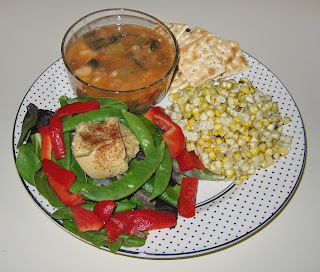 My wife picks up great soups every week from a woman, Melissa, who specializes in great soups. They're usually vegan and when they're occasionally not, she lets us know so we don't purchase those few varieties. This week she had a gazpacho soup as well as a vegetable soup with edamame and fresh herb dumplings - as always, they were both good. I served the vegetable soup along with some corn-off-the-cob that I mixed in Earth Balance margarine, salt, and fresh lemon juice into. 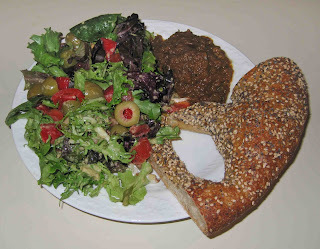 I also had some bread with olive tapenade. Last Wednesday when we went out to Cafe Trilussa in Chapel Hill, I enjoyed a nice Italian potato dish that the chef-owner Giovanni made for us. He described making it by cutting a special kind of potato that he buys at area Mexican grocery stores into thick strips, boiling (or did he cut after boiling? ), and then briefly cooking in oil with pieces of lemon, serving with capers. 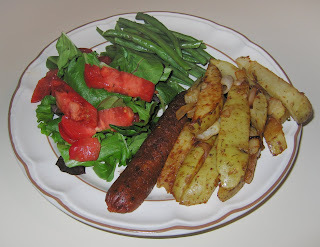 Not only did we bring leftovers home, that was the basis of tonight's dinner, but Giovanni gave me several large potatoes (so I could make the dish) which looked like the Yukon Gold variety, but he assured me they weren't. 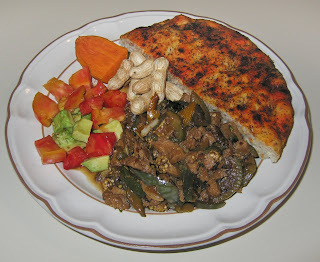 I served the leftovers with a simple tempeh and garlic saute, adding soy sauce when the tempeh was nicely browned. A salad of carrots (I recently learned that baby carrots are usually full-sized carrots cut up!) and radishes rounded out the meal. I have a lighter teaching schedule in May with few classes scheduled. There probably won't be as many nights eating out. By the way, June 6th marks the fifth year I will have known my wife - and still no repeat dinners that I've cooked for her! 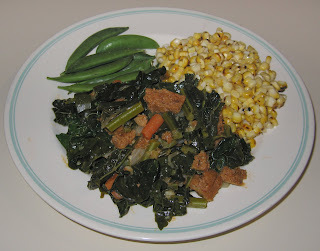 I had some kale and decided to make a dish, preparing the kale similarly to how I have in the past. I started sauteeing, in a tall sauce pan, a small sweet onion, diced into medium 3/8" cubes. A few minutes later, I added about a dozen baby carrots, halved. As in the past, I hand tore the stems from the kale leaves and cut them into 3/4" lengths, which I added as well. I cut a spicy vegan Mexican Chipotle sausage by the Field Roast Grain Meat Company into half lengthwise, then into approximately 1/2" chunks, and added that to the pan. Once the onion was just browning and the other ingredients seemed cook, I added water, leaving space for the kale leaves, and brought to a boil for 5 minutes; I would have added a cube of vegan bouillon, but I was out. Also, I had forgotten, but I usually like to add a little cumin in the last minute before adding water. I then hand tore the kale leaves into approximately 1-inch squares, added to the pan, and cooked another 5 minutes or so. I drained the broth and served a cup of it to my wife, who enjoyed it, and saved the remainder (maybe 2/3 a cup) for use in cooking this week. I mixed in some salt and tarragon to the kale dish. I served this with three ears of fresh corn-off-the-cob; I grilled on the open flame of my gas stove, stripped the kernels, then mixed in Earth Balance margarine, salt, and fresh lemon juice. Tasty pea pods completed the meal. We had visitors yesterday from Atlanta and it got late. I was planning on making a kale risotto for them, but my wife was hungry and it was a great opportunity to introduce the couple to Ethiopian food, which they had never had. We ate at Queen of Sheba in Chapel Hill - the food, as usual, was very good, and they loved it!